My hubby couldn’t decide if I was going for a little Spanish flair here, Little House on the Prairie, or if this was my proper librarian getup. All I can say is, pink and yellow warm my soul. And someone bring me some tea and crumpets, stat! Would you judge me if I told you that this top is actually my nightgown? Maybe it is and maybe it isn’t…but if it is my nightgown, isn’t it nice that all I have to do is remove the skirt and slip straight into bed? I’d call that a win. A hypothetical win of course. Yo, yo, yo. And that’s all I have to say about my motorcycle-vest-meets-grandma’s-skirt action. Shouldn’t I be doing the salsa? This was not the scarf I intended to use, but of course I couldn’t find the one that I wanted. Also, I should have skipped the lazy and finished buckling my shoes, but I’m over it so you should be too. So let’s talk about the midi skirt. I tried to pair it with some flats and sandals and it was a definite no-no. I think the trick with this length is to make your legs look as long as possible and be mindful of proportions. Hope you enjoyed the show. That’ll be a virtual buck fifty. Thanks for playing. 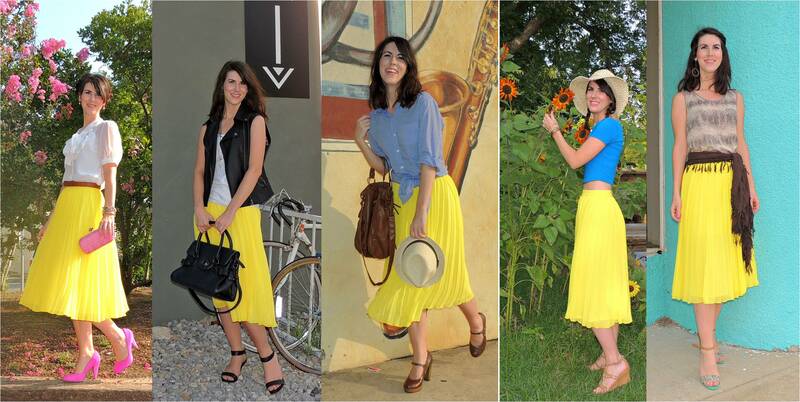 This entry was posted in Fashion, style and tagged midi skirt, one piece many ways, pleated, yellow by Petit Poisson. Bookmark the permalink. I love what you did with this skirt! It’s a style I totally can’t even wear, but it looks so great on you. I especially love the very first outfit. So 1940s! thank you for the response 🙂 I think the first look was my favorite too. You’d be surprised what you can wear, having a long torso and shorter legs, I wouldn’t have said I could wear this either. not enough “like” buttons for this one!!! AND huge huge kudos to hubby photographer!!! Amazing job on all counts!!! LOVE LOVE LOVE! I can’t even decide my favorite look. I think that skirt is just awesome! ooo i love the look w/ pink heels the best!! So cute! This is a great idea for a post- you did a great job styling this so many ways! Thank you, I thought it would be pretty with a black top as well, it was actually difficult narrowing it down to five looks. Oooh that skirt is AMAZING! I love hot pink and yellow together so the first looks is my favorite! So cute!! I love them all, but the pink and yellow is my fav for this summer! Absolutely adorable, I love it with the pink shoes! Wow, I love all of these looks! I love the skirt with the leather vest! LOVE the skirt and ADORE the pink heels! I love all of these looks. That skirt is amazing! I love yellow! Okay, first of all, that yellow skirt is so pretty! I love pleated skirts and it is just so flattering on you. Which is kind of a big deal because midi-skirts are so hard to wear. I’m 5’10” and I just can’t pull ’em off. Secondly, I love the crop-top look. So cute! Oh my goodness that skirt is so cute! And I love your outfits! The first look is my favourite, lovely colours and textures. Love your One Piece Many Ways post. I have a white pleated midi skirt that I don’t wear often because I can’t figure out how to. You provided some great ideas. These are all such great looks! !